Learn more about Consolidated Service Group and the services we provide. Consolidated Service Group (CSG) spent the last 20 years building individual companies that specialize in specific commercial exterior building services. 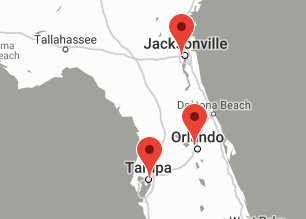 These companies include local CSG branches in Orlando, Tampa and Jacksonville, ABC Paving and Sealcoating, AFS General Contracting, and Hartman’s Appliance Repair. The result is one point of contact that comes with a vast wealth of experience in a variety of commercial facility services. CSG’s portfolio of commercial facility services enables our clients the convenience of working with a single provider for all of their commercial property needs. Contact CSG today at 866-793-3735 or visit our website at https://www.csgcamservices.com for an online proposal. CSG offers Orlando general contracting services and provides commercial Property Maintenance, janitorial, and ancillary facility maintenance services to clients in a wide range of industries and for a variety of property types. In Tampa, CSG’s office offers local businesses facility maintenance and general contracting services all under one roof. The key to CSG’s success is being a single source point of contact for all of a client’s building construction as well as interior and exterior commercial facility maintenance needs. CSG Jacksonville offices enable local businesses to benefit from not only having a general contractor but a full service commercial facility maintenance partner all rolled into one point of contact. With more than 20 years of experience, ABC Paving and Sealcoating is Florida’s leading paving contractor. ABC Paving and Sealcoating provides commercial organizations with the highest level of customer service, professional workmanship and services including: asphalt paving, asphalt repairs and prevention, pothole repairs, sealcoating, line striping and marking, thermoplastic, crack filing, signs and safety devices, concrete sidewalks, concrete curbs and site preparation. We use our experience and the latest equipment available to get the job done right the first time in a timely, cost effective manner. For more information about ABC Paving and Sealcoating, visit our website at https://www.pavingandsealcoating.com or call 866-934-7623 for a free estimate. Hartman’s Appliance Repair is Central Florida’s best home appliance repair service. Our family business has been servicing Florida homeowners for more than 30 years. Hartman’s is well known to homeowners in the Central Florida area because appliance repairs made by us are made right the first time. We are proud to earn your referral business and work hard to ensure your satisfaction. For more information visit http://orlandoappliancerepair.services or call 407-772-4849. To obtain a free estimate please call: 1-866-793-3735.